Today, on the Feast of St. Thomas More, the four bishops of Massachusetts are launching a prayer and education campaign for the vocation of marriage. Over a year ago, I assembled a committee to look at what the Church in Boston could do to help promote the Sacrament of Marriage in our remote preparation of youth and in proximate preparation, what we call the Pre-Cana. I also wanted to find ways to help people experience the grace of the sacrament and to be able to fulfill the very special mission the sacrament has in the world. In our country, more and more people are opting not to get married but instead to cohabitate. In Massachusetts, the government has redefined marriage away from its original purpose, which is so intimately connected with having and raising children. Certainly, the vocation to marriage, which is the way most people live out their discipleship, is something that is very, very important. And it certainly is being obscured in our modern and secular culture. I often tell people that part of transmitting the faith is instilling in our young people a sense of vocation. For most of our young people, their vocation is to marry and to have children. When I speak to confirmation classes, I always speak to them about vocations, particularly the vocation to marriage. People often talk about the shortage of vocations to the priesthood, but just as grave for the Church is the situation with the vocation to marriage. Another thing we need to instill in our young people as we pass on the faith, is a sense of sharing a common mission with the other members of the Church in trying to transform the world to make the values of the Kingdom of God more present among us — His kingdom of peace, of justice, of love and of service. We were very enthusiastic about the launching of a new statewide educational campaign on the meaning and importance of marriage and we were very glad that the bishops in the state�s other dioceses are collaborating with us in this effort. We hope this campaign will help people to refocus on the sacramental meaning of marriage. I am very grateful to all of those who have lent their talent and time to be a part of preparing this initiative, and I want to urge all of the Catholics of the archdiocese to help us to promote the sacrament of marriage. We need to rekindle a sense of vocation in all of our people, especially marriage as a call to holiness, a call to service, so that our Christian families will truly be sanctuaries of life where new generations of disciples are born and reborn in the faith. This week I have participated in the spring meeting of the U.S. Bishop�s Conference, which was held in the Diocese of Santa Fe. The spring meeting is hosted in a different city each year. The bishops meet again each fall in either Baltimore or Washington. 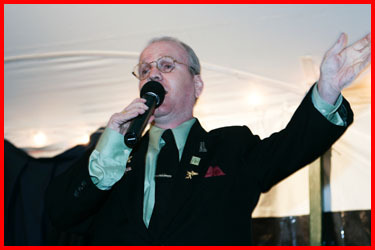 The gathering had a retreat format. We met at a hotel in Albuquerque which was owned by an Indian tribe. Cardinal Marc Ouellet, the Archbishop of Quebec, was the preacher for the retreat. He is a wonderful theologian who gave fantastic talks. He was also there to promote the Eucharistic Congress that will be held next year in Quebec City. During the course of the week, we had also seminars directed at the different priorities of the Bishop�s Conference. We looked at faith formation, marriage and pro-life issues. It was a very profitable gathering. In addition to the larger gathering they always add a number of committee meetings, which allows us to save on travel since we are already together. I am on three of the committees ? the Latin American Secretariat, Committee on Immigration and the Missions Committee. Though I was unable to attend the missions meeting of a scheduling conflict, I attended the other two meetings and was pleased to discover at the one on Latin America that the Catholics of Boston were the largest contributors nationwide to this year�s Diocesan National Collection for the Church in Latin America � $403,354. (The total amount collected nationwide was $7,147,635.) At the session, committee members discussed the different proposals for grants that we receive from bishops and missionaries throughout the Caribbean and Central and South America. The Immigration Committee meeting was spent talking about the new immigration legislation. U.S. Secretary of Commerce Carlos Gutierrez came to New Mexico to talk to us and urged us to support President�s Bush�s effort to pass a comprehensive immigration bill. We also spoke, via conference call, with Senator Robert Men�ndez of New Jersey. He has been very involved in immigration matters. The Bishop�s Conference is very anxious to ensure that the principle of family reunification is not jettisoned from the new legislation in favor of people with more academic qualifications. 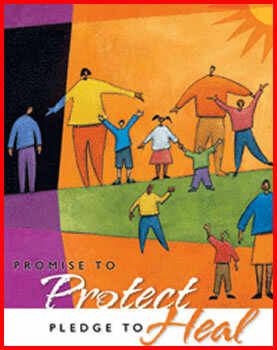 We see that one of the strengths of our nation�s immigration laws has been the family. That has been a constant in our policy, and we would like to see that maintained. Our second concern is that some of the regulations concerning the path toward citizenship have become too unreasonable and burdensome. Sometimes people are required to go back to their own countries and come in again, which makes it difficult for them to pay their bills and maintain their jobs. Some of the regulations that have been introduced, we feel, are too punitive. The purpose of the legislation must be to try to deal with all those who are already here and also to ensure that the United States is in control of who is entering the country. If we do not come up with a way that makes it possible for people to regularize their situation, then it will defeat the purpose of the legislation. The meeting went very well, and the bishops were able to share our concerns with Secretary Gutierrez who answered our questions. He and Senator Men�ndez had different points of view, but both were in favor of this legislation. Gutierrez was much more favorable to the present legislation whereas Men�ndez would like to see changes such as family reunification. He said, �Well, if we had those regulations before, Jonas Salk � who developed the Polio vaccine� and many other people would never have gotten into the country because their parents were laborers and did not speak English.� Because our country allowed reunification of families, their children became luminaries in the United States. 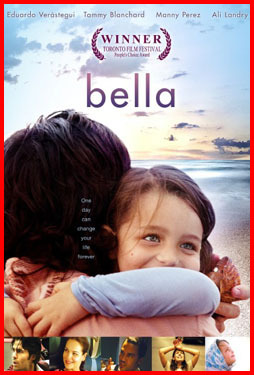 On another evening, all the bishops were invited to a screening of the movie �Bella� and to listen to a talk by the film�s director, Alejandro Monteverde. It was all very well organized for the screening, they even served us all popcorn! We were very happy for that�lol! 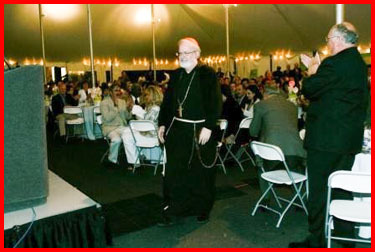 At St. Coletta & Cardinal Cushing Schools of Massachusetts they have an annual fundraiser, which they call a spring event. Cardinal Cushing started this school for children with special needs 60 years ago with the Franciscan sisters from Milwaukee. Cardinal Cushing had a very great love for children with special needs. It was one of his passions in life, and so he was very instrumental in establishing the Cardinal Cushing Centers. 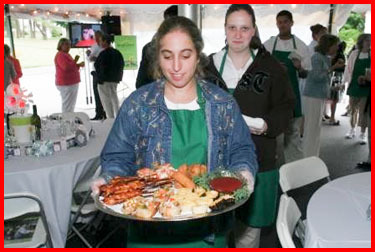 There were about 500 people there for a dinner and fundraiser. The youngsters performed this new kind of synchronized dancing. It is very athletic and jumping around … all very synchronized. 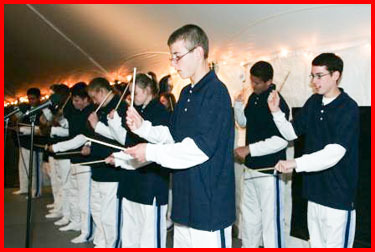 The percussion group formed out of an occupational therapy exercise called, Brain Gym. 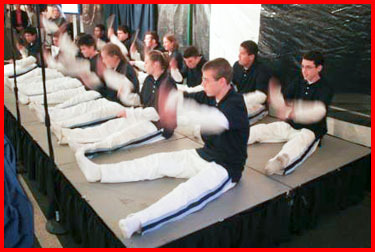 It involved crossing the mid line of the body with the arms and legs and improves concentration and learning. And then one young man, a graduate from the school, sang from the musical �Man of La Mancha.� He had a beautiful voice. They honored a number of people, including one of the Franciscan sisters who was there. 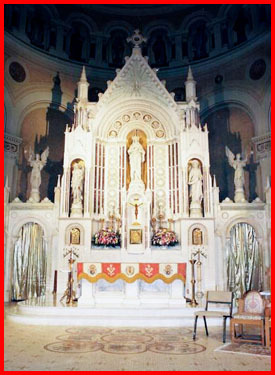 Cardinal Cushing also built a replica of the Church of the Porziuncola in Assisi in the Hanover school campus. I visited the chapel. Our local Porziuncola. That’s a statue of St. Francis in front. 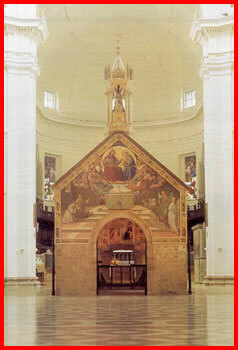 The Porziuncola is a small chapel that St. Francis restored becoming his home. There he founded in 1209 the Order of Friars Minor. St Francis assembled all the Friars in the Chapter every year at the Porziuncola to discuss their rule and to renew their dedication to the Gospel Life. The original Porziuncola in Assisi is now covered by a big basilica, whereas the one we have in the archdiocese is more like the one St. Francis would have seen, which was surrounded by woods. The exterior is a perfect replica of the original (the stone was even brought from Assisi) though the inside is much fancier, and much more finished looking than the original. Cardinal Cushing was so fond of the site, he chose to be buried there. As I mentioned in a previous post, I was fortunate enough to be able to celebrate a diaconal ordination Mass for the friars of the primitive observance at Mission Church three weeks ago. Photos we requested from the event have only just arrived so I thought I would share them with you today. The Basilica of Our Lady of Perpetual Help � known by almost everyone as simply Mission Church � is the only basilica in the Archdiocese. It is Boston�s Redemptorist church and, as you can imagine from the name, is dedicated to Our Lady of Perpetual Help, the special patroness of the Redemptorist order. When I was in the West Indies, it had been a Redemptorist mission, and I was always very edified by the great devotion that the Redemptorists had instilled in the people. On Wednesdays, the churches would always be filled at Mass because it was the novena Mass to Our Lady of Perpetual Help. 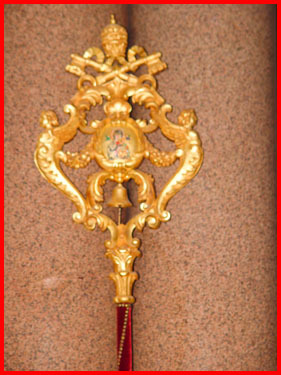 This umbrella is one of the symbols of a basilica. 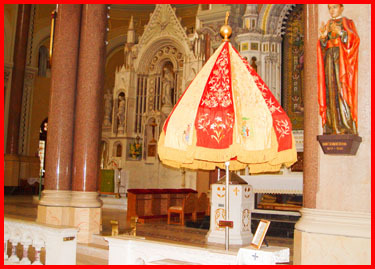 Originally, umbrellas like this were used to protect the Holy Father from severe weather. It is kept half open to signify that the Basilica is always ready to welcome the Holy Father. This processional miniature tower with a small bell is yet another symbol of a Basilica. The Redemptorists have some of the largest and most beautiful churches in this hemisphere. Recently, our Holy Father visited the Basilical of Our Lady of Aparecida in Brazil, which is run by the Redemptorists and is the largest church in the western hemisphere. 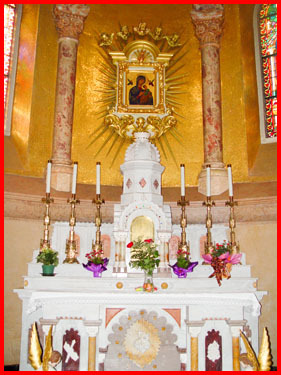 Many of our people here in New England and from the rest of the United States, I am sure, have visited the Basilica of Sainte-Anne de Beaupr� in Quebec, also a Redemptorist church. 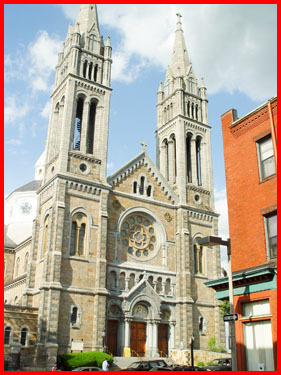 In Brooklyn, the largest church in the diocese is the Redemptorist�s Our Lady of Perpetual Help. We are very grateful for all of the wonderful ministry that the Redemptorists do, and particularly at their parish here. These photos are just to share with you the beauty of our only basilica. I am going to Rome next week to attend some meetings at the Holy See. While I am there, I will be at the Wednesday audience, and then on my birthday, June 29, I will be at the Pallium Mass, where the new metropolitan archbishops receive their pallium from the Holy Father. Archbishop elect Joseph E. Kurtz, who has just been appointed to the archdiocese Louisville, will be among those receiving the pallium next week. Since I will be away for my birthday, my staff presented my with a surprise happy birthday cake yesterday. 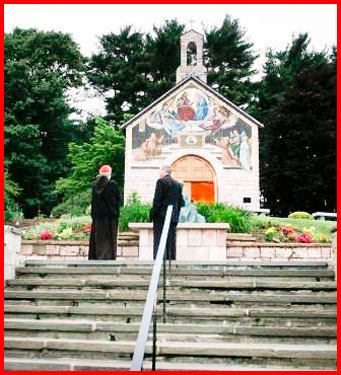 Finally, for my photo of the week I have chosen this icon and prayer which have been printed on the 1 million prayer cards to be distributed throughout Massachusetts. I encourage you all to pray this prayer daily that the vocation of marriage may be strengthened. new life created in your image. they join their sufferings to the Cross. love is nurtured and family life begins. providential care for us. Amen. 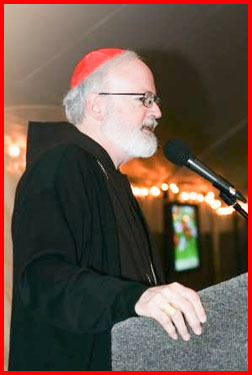 Happy Birthday,Cardinal Sean! Safe trip to and from Rome. I have twin sons who I named Peter & Paul who are now 41 yrs. old. I’m privileged your birthday falls on one of their birthdays. Always read your blog and look forward to seeing it on your return from Rome. God Bless! this is a wonderful website. It has strengthened my faith! I enjoy reading your blog….I am grateful to God and Our Blessed Mother for choosing you as our Shepherd. Thanks for sharing your beautiful trip to Italy with us. Your refreshing spiritual thoughts encourage weary souls in the journey across the parched landscape of human experience into the enjoyed presence of God. Well, it certainly is your love Cardinal Sean that will transform us all into what we were created to be. You are our conduits of the Kingdom of God – being the Light of God – to be used by God to facilitate the transformation of people into the Image of God. May Our Blessed Mother always remain close to you. Thanks for your blog filled with loving intention……Thanks for your presence. Dear Padre Sean: We are remembering you in our prayers on the feast of Saint Peter and Saint Paul, your birthday! We are happy to know that you are spending your birthday in the city of many martyrs and saints. We commend you to the care of our Lord and His Mother and all His Saints. Your life always remains us of Christ presence. He really lives in you and many saints are also surrounding your life because of your birth and your religious consecration. To name a few: Peter, Paul, Patrick, both Johns, the Baptist and the Evangelist, Saint Francis and the faithful protector of the Church: Saint Joseph, because you are a tireless and faithful worker for the sanctification and unity of the Church. Because of your birthday, we want to salute you with the words of the Mexican �Ma�anitas�. �……………..El d�a en que tu naciste nacieron todas las flores y en la Pila del Bautismo cantaron los ruise�ores…..�. We send you our love Padre Sean. You are a blessing from God to the entire Catholic and Apostolic Church! 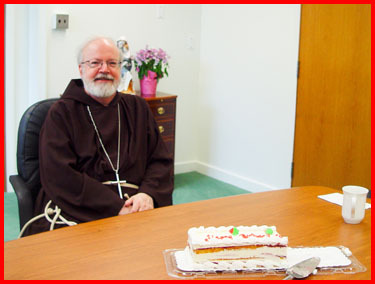 Happy Birthday Cardinal O’Malley from the Miranda Family in Paterson, NJ and the Gefroh Family in Hawaii! Enjoy reading your words so much ! Have a wonderful Birthday in Rome!!! 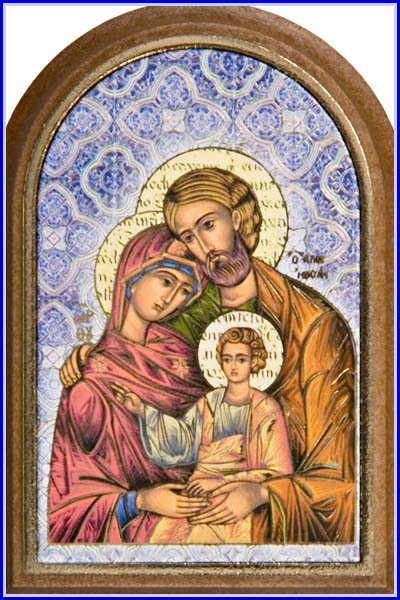 Those marriage holy cards are so beautiful, both the image and the prayer. Is there any way for people who live outside of the Archdiocese of Boston to get a holy card? As a sort of newlywed (one year next month! ), I find the prayer paricularly inspiring. I just found your statement from June 8 about the upcoming vote. Everything you wrote was beautiful. But I did not see where you encouraged the catholics of the state to call and write our senators. Maybe I missed it. My point is that I think it is critical to connect the ‘dots.’ As catholics we are not used to ‘storming’ the gates. There is a disconnect between what we profess and our lives as citizens. The false understanding of seperation between Church and State commonly held is that a catholic cannot be politically active concerning moral issues! This needs to be addressed. Catholics need to know they can enter the political arena and FIGHT for what they know to be true! I applaud your efforts to strengthen our understanding of the sacrament of marriage. It is also heartening to see the other Bishops of Ma. joining your efforts. My question concerns the strength and clarity of your message. Are Catholics being cathechized in a simple clear manner what marriage is and are they being ENCOURAGED to make their voices known in the public arena!!! Will you explicitly tell us that it is our moral duty to let our Catholic morality inform our political involvement! I am disheartened at the seeming timidity of our Church to speak out Forcefully and Clearly. It seems that many of our Priests are not supporting you or the other Bishops because of their own agendas. They side more with Kennedy than with you. Can you circumvent them? Well maybe you already are. I think the debate about abortion and reception of communion is applicable. The response of many Bishops to politicians is so ‘nuanced’ as to be undecipherable. This scandalizes average Catholics and confuses them. I believe that the new evangilization called for by JP2 must start at home. 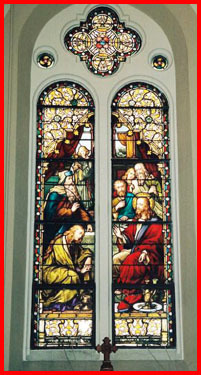 Many catholics are indistinguishable from non catholics. Maybe one starting point is that as Catholics we have Universal beliefs. To not share those beliefs, whether one is a priest or a layman, is very serious. We are called to admonish one another. This may cause discomfort for both parties but isn’t it time? These comments are based on my experience and knowledge which I know are very limited. I’m not in your shoes so how can I know the crosses you carry. I hope that these thoughts have been expressed with the utmost respect. Your deserve that much and more. “We” find ourselves at a preciptous moment in a variety of affairs at this time in history. Often in our culture, especially in the West, we find a need to understand patience. With so much instant gratification and consumerism, we forget that at times a harvest can take a great deal of time to mature. This, of course, is the case with matrimony. Often, marriage has its beginings in introspection and focused care for children. This can be a trial… with the indifference of our culture to the value of social order… but also a time a great joy and growth. 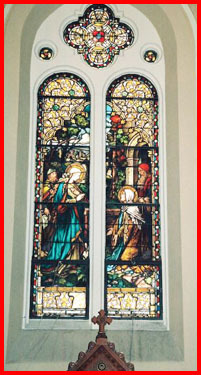 Often, then, marriages take on a more outward reflection of God, in its particular and unique reflective quality. Providing hope and joy for the future of mankind and neighbor. It is important, then, that we seek to understand the difficulties that occur in marriage. From those forced upon it by a secular society, so often self interested. Marriages so often planted at great distances from extended family. And the propensity, even, for those in such a relationship to be lonely. It is by understanding how other suffer, that we can see their perspective and offer whatever personal relations, programs, and even legal assistance that springs from the charity of our hearts. May you find great joy in your birthday, and the Holy Spirit provide you with great leadership, at this prudent moment of introduction. I thnk yiur blog is outstanding and lets those interested folks a chance to hear your views directly without a filter. Regarding the recent definition of marriage. I was distrubed by my local Rep (Galvin from Canton) and my Senator (Joyce who represents Canton) and their decision to deny me the right to cast a vote on this very important issue. Senator Joyce is a member of the Knights of Columbus. I asked our Grand Knight to inquire of Supreme why the K of C cannot expel Senator Joyce. He holds opposing views on marriage, embryonic stem cell research, abortion to include late term and other things the church and also the K of C oppose. I am told that the K of C can do nothing because the church has not sanctioned him. 100% of the members of our local Council would like the Senator expelled but we are told we cannot do it because the Archdiocese will not take action or at least publicly sanction the Senator. I have sent an email to the Archdiocese office via the home page but have not received an answer or even an acknowledgment of my email that I will get an answer. Hence my appeal directly to you. Have you directed the K of C not to expel members unless the Archdiocese takes some action first? Thanking Our Lord for your untiring and inspirational journey. It certainly is no surprise that your birthday coincides with the Feast of St. Peter. May his intercession continue to give you strength! Birthday, that you may envoy in Rome. now speak a lot about you every day. Very best wishes and warm thoughts to you from Paris. Wishing you a happy birthday this week. Thank you for your efforts on the immigration issue. Many families have endured great hardship and endless red tape just to have a chance at escaping extreme poverty and to work for a decent wage and raise a family. I am sure the legislation is not perfect but I think it moves the country in the right direction and I think could be tweaked later. I think it probably needs some significant tweaking however. I agree with your concerns regarding family reunification. Also, if they make the legalization process so overly difficult with $10,000+ worth of fines and too many legal hoops and bureaucratic red tape that our governmental agencies, not to mention the immigrants involved, won’t even be able to handle then I don’t think it will work. I am concerned that our government is not administratively efficient or competent enough to handle the bureaucratic workload that this legislation will entail. Before the government sets up a new process I think we need to make sure the agencies have the capability to handle the volume and paperwork. I feel that the country needs to make it easier for people who want to come here to work and have a better life for their family to do it legally – within the system. We need to create an efficient and fair system whereby they can do that. Our country is blessed in that if you work hard you can get a good job with a decent wage and good benefits and that is so rare in other countries where there are no jobs – just poverty and the struggle to survive. 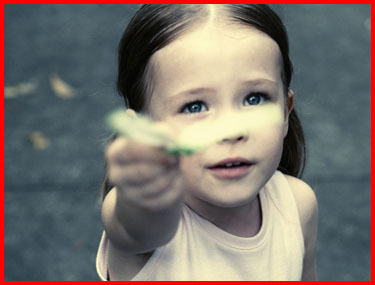 I think it is our responsibility to share the opportunities we are blessed to have with others not so fortunate. I always read your blog. Thank you for such interesting reports every week plus pretty pictures and real good homilies. I would forward them to friends sometimes. I have a request though I am not from your Archdiocese. Pls. send me a number of prayer cards (promoting marriage vocation) to share with some friends and for myself, of course. They are beautiful. Thank you very much. My address is P.O. Box 683223, Houston, TX 77268. God bless you and your ministry as well as your Archdiocese. Prayers for your birthday!!! It is a breath a fresh air to read your blog every week! Despite your struggles in Boston, the Church is alive and well. Your ministry as a Friar, first, gives many of us courage. Our area in Ohio (Diocese of Youngstown) was in the news this week about the missing pregnant mother in Canton. Unfortunately, it was announced that she and her unborn nine-month child were found dead. 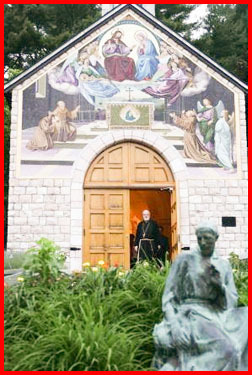 Just returning from a pilgrimage from the Shrines in Canada, I offered prayers for them and their family. This continues to show to us the condition of family life or lack of it in our country. Please pray for us in those beautiful historic churches in Rome. Like many others in the commonwealth, I was upset by the recent marriage vote on Beacon Hill. After awhile, however, I was able to calm down and remind myself that although the battle had been lost, the war was not over. I remembered some stories I�d read recently about great Rosary victories in Church history. A Google search pulled up the following information I found very encouraging…. In his Apostolic Letter on the Rosary Pope John Paul II mentioned Pope Leo XIII’s Encyclical Letter: �Supremi Apostolatus Officio� on the Rosary, written in 1883. “It has always been the habit of Catholics in danger and in troubled times to fly for refuge to Mary, and to seek for peace in Her maternal goodness; showing that the Catholic Church has always, and with justice, put all her hope and trust in the Mother of God. And truly the Immaculate Virgin, chosen to be the Mother of God and thereby associated with Him in the work of man’s salvation, has a favour and power with Her Son greater than any human or angelic creature has ever obtained, or ever can gain. And, as it is Her greatest pleasure to grant Her help and comfort to those who seek Her, it cannot be doubted that She would deign, and even be anxious, to receive the aspirations of the universal Church. Just Wanted to be the first to greet you a Happy, Happy Birthday. I always read your blog every week and also wanted to thank you for sharing your life to us. You mentioned that you will be in the Vatican to attend a series of meeting, if you happen to talk to Cardinal Rosales from Manila, please thank him for his visit here in California. I hope and pray that you will have a wonderful birthday celebration in Rome. May you have many more birthdays to come. Peace and blessings always to you and your loved ones. Wishing you man blessings on your birthday and may you have a safe and happy trip to Rome. The marriage vocation card looks beautiful. The prayer is beautiful too. 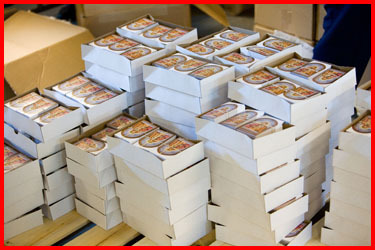 Thank you for that and I hope my parish receives some cards soon. I think that if more people in the pew understood that Christian marriage is a holy order requiring a similar chastity, obedience, and divine providence as any religious, the sacrament would be venerated as the holy institution that it is. 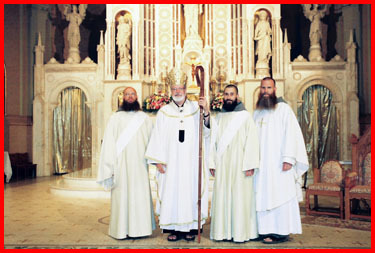 Thank you for the ordination photo of the FPO Friars. With all my heart I Love all of you with the hearts of Jesus and Mary. You are included in my daily prayers and hope that you remember me in yours, too.